You begin to look over all of your numbers for your business for the quarter. After a few minutes, you wish you hadn’t. You want to scream due to how bad they are. What have your employees been doing all quarter? You walk out of your office and notice several of your employees lagging behind. When you start asking questions they seem to perk up a bit, but before you made your presence known, they looked like zombies. How are you going to increase their motivation? The best way to learn is by doing. 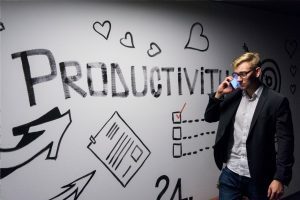 Here are a few things that other companies are doing to increase productivity that you should try out yourself. If an employee is tasked with answering ten emails and starting on a huge project as soon as they walk through the door, they are going to tire out fast. Not everyone is a morning person, so you should let them breathe a little before giving orders. Maybe keep snacks and coffee in the break room that they can go get first thing in the morning to give them a jolt of energy or just don’t task them with huge projects first thing in the morning. Give them time to wake up a little and save the big duties for the early afternoon. Similar to not giving them huge tasks to do first thing in the morning, make sure you also don’t force them to multitask throughout the day. Not only will they burn out after a few hours and be less productive as a result, but it’s also extremely stressful. How would you feel if someone told you that you have to do 10 projects while answering phone calls and emails and filling out reports on those 10 projects? You would tear your hair out. It’s harmful to the mind and the soul. Many employees just need a little bit of incentive to work harder. If you give them work perks, they will want to work hard to get them. These can be rewards that they have access to on the job site or perks they earn over time. For example, some places have an onsite gym. Gym memberships can get expensive, so if they can get one through work, they will want to work hard to make sure they can keep having it. Most jobs give maternity leave, but if you also give paternity leave, this will greatly impact how productive your employees are so they can stay employed with you. Not a lot of jobs offer this perk. A lot of times when employees aren’t productive, it’s not all their fault. Sometimes it’s the fault of the company. There is a simple solution to this: let your employees have a voice. Encourage them to come knock on your office door when they have problems and talk things over with you. It doesn’t even have to be because of a problem, either. If they have a bright idea and you actually hear them out on it, they will feel like they are really making a difference in the company. If you don’t hear them out, then they will get into the mindset of, “Nothing I say will really matter or change things.” That will cause their productivity levels to drag a bit. Giving them a voice makes things feel like a group effort in which everyone is part of something bigger. You send an employee an email to start on a project and finish it before their shift ends. They end up not checking their email until hours after you send it, so the project doesn’t get done. This is a normal occurrence in the office, and it really slows down production. Instead of relying on emails, you should switch everything to group chats and messaging. This way, when something needs to get done, you can just instant message them at their computer and they’ll get it right away. Slack and Skype are perfect choices for this. Long ago are the days in which everyone tackled tasks separately. Collaboration has become something that is essential to the productivity of any office setting, so you should invest in collaboration software. These programs make it easier for you to have meetings no matter where you are in the world. It also allows remote employees to get in on the fun. If you find that your employees just don’t work well together, then you can even buy Organisational Development programs that can help with that. You may find that you just have a bunch of employees who are easily distracted. While you can’t force these apps on them you can passive aggressively tell these employees about them. Momentum turns tasks into a sort of game. Your employee can put tasks that they need to get done into the app, and for each one they complete, they create a chain. It’s something that they may find to be really satisfying. Mac has an app called “Focus” where your employee can block websites that they know are going to be a distraction for them. They can even schedule blocks so they can allow the sites to become available while they are eating their lunch and then have them go away again after they’re done. If your numbers for the quarter are horrible because your productivity is low, it may be time for you to sit back and evaluate how to fix it rather than pointing fingers right away. Use these tips to increase productivity to have the same well-oiled machine that other companies do. Did you know that you can DIY organization crafts that will make your office more productive? Keep reading for a few neat ideas. Previous post: Who is Roger Stone and Why is He Indicted by Mueller?